Minimum requirements statistics do not provide enough accurate info to new and prospective users trying to determine a suitable flavor for their machine. People need to know if an OS will run smoothly on their hardware. 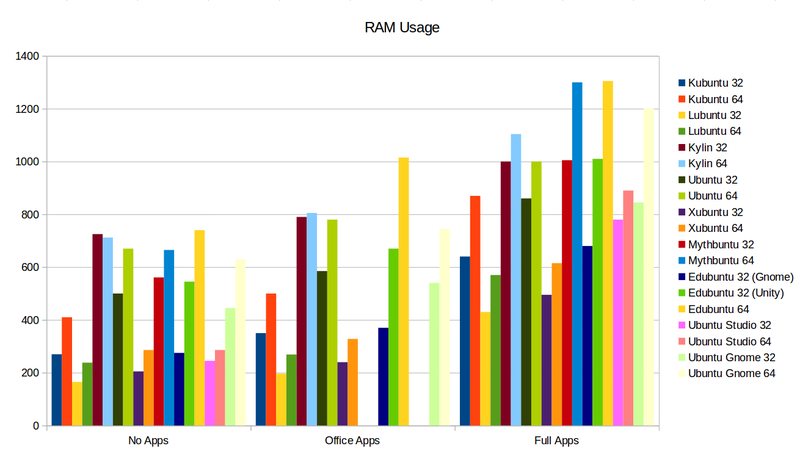 We need the ability to easily compare Ubuntu flavors in terms of resource usage and management. This data could be depicted using bar graphs and with different versions (13.04, 13.10, 14.04, etc) in separate graphs but most important are the latest versions. How do they compare under standard use case scenarios such as using Firefox, LibreOffice, or watching full screen flash videos or Netflix? Will my machine be snappy and responsive running Ubuntu or am I better off with Lubuntu or Xubuntu? What are the minimum system requirements for a reasonable speedy and responsive system? Official minimum hardware requirements specifications do not provide this info. For all cases if the maximum amount of RAM was lowered, their general RAM usage was also lower. For example, Lubuntu in a computer with 4 GB of RAM would use 165 MB of RAM. But if you took out 2 GB of RAM and only left 2 GB in total, it would use 125 MB of RAM. If I again took 1 GB out, leaving only 1 GB, it would use around 100 MB of RAM. So the normal RAM usage can vary depending on the amount of total RAM. All Distributions adapt to their hardware. 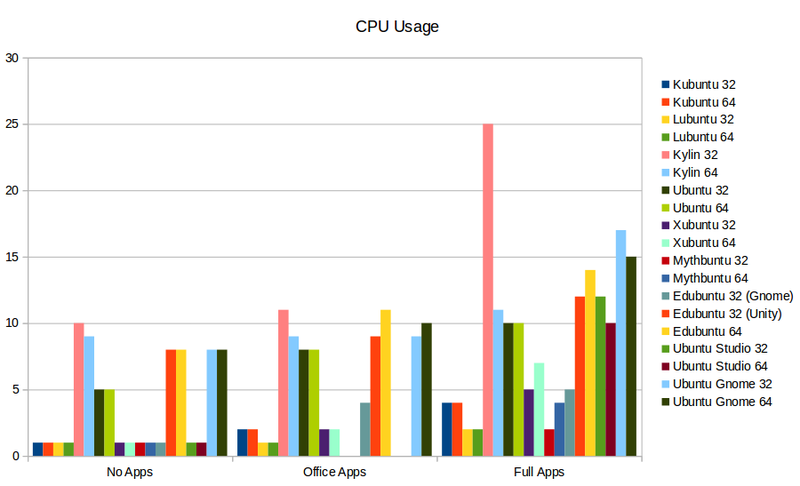 Which that said, if you have a low spec CPU, the usage might be more than the graph. If you have a more powerful CPU, they usage could be lower than the graph for that particular distribution. The same can be said about RAM. It should be noted that Linux tries to use as much resources as possible to have the most optimum system available. Not used RAM is wasted RAM. This type of thinking is NOT to be confused on how Windows uses RAM. Both use that extra RAM in different ways. The values in the graphs can vary between hardware differences, distribution versions, desktop versions, updates and more. This are just to give the end user an idea on how they compare in one particular case scenario. But again, this type of benchmark can change a lot if we take into consideration the type of graphics card, driver version, distribution version, desktop version, etc..
Now, to be fair, all Desktops from the time they were benchmarked have received numerous updates in regards to their rendering. 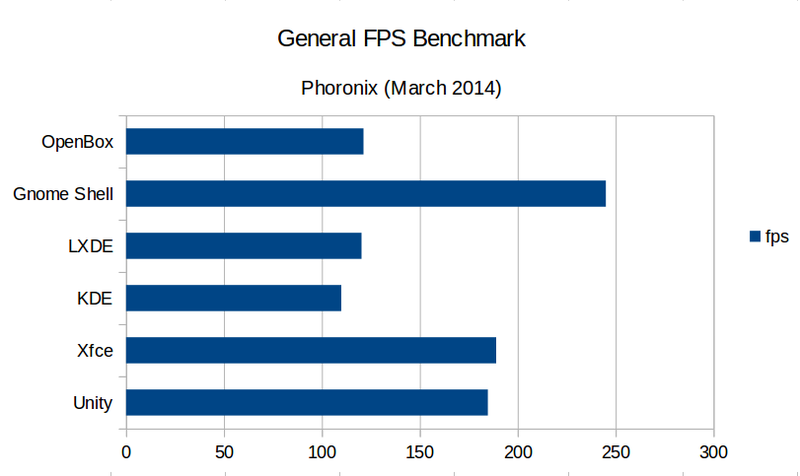 That is why Phoronix made another FPS Benchmark in which we can see some improvements. The final result was that, at least for Unity, it gained around 10% better framerate in cases like the Xonotic 0.7 (1920x1080) where it went from 112 (Low Benchmark) & 42 (High Benchmark) to 120 (Low Benchmark) & 63 (High Benchmark). For menu speed, this does not vary much on all distributions. It can be quicker on Unity (Using Dash) if you disable the Online Search in the Security & Privacy option in the System Settings. When doing all of this tests, I found out more than I thought I would. For instance, I was really not expecting KDE to use that low amount of resources. I thought it would take like 1 GB of RAM. Another thing I found out was how quickly Lubuntu and Xubuntu were it terms of booting and using the whole system. of course, a almost common fact remains, the less resources a distribution uses, the less options you will have. So a user of Kubuntu or Ubuntu can enjoy several features like Samba sharing, easier printing configuration and many other features but an OpenBox or LXDE user would have it more difficult or would take longer to achieve the same objectives (Like sharing a folder). If you wish to see CPU/RAM specific usage for the cases mentioned here I invite you to read What is the difference between Ubuntu and its derivatives? which shows how each distribution behaved under different loads, apart from other information. The only difference between the different flavours of Ubuntu is the installed desktop. The basic minimum system requirements of several Ubuntu desktop respins is already covered in this question: What are the system requirements for each flavour of Ubuntu Desktop? See What are the system requirements for each flavour of Ubuntu Desktop? There are several articles on Phoronix comparing desktop performance. You will notice that when it comes to graphics, even though every desktop is running on the same software (Xorg+kernel), there are some performance differences due to the use of different compositors. There have been benchmarks of the responsiveness of the Linux kernel scheduler, but desktop responsiveness has not been benchmarked as far as I am aware, probably because it is is laborious to do. The usual way is to record video of an input event (keyboard or mouse being used) and the monitor of the PC, and then play back the video and count the frames between the input event and the video response being completed. What is the difference between Ubuntu and its derivatives? What are the system requirements for each flavour of Ubuntu Desktop? How to keep Ubuntu in max performance? How to compare performance between desktop graphics card and laptop graphics card?